"My grandmother, Gladys Payne Gittens, came here from Barbados about 1906. She read this to me over the phone when I was in law school in 1978. Thanks to my friend Elayne, the Soulful Yenta, to whom I gave a copy, I was able to find this on Mother's Day. 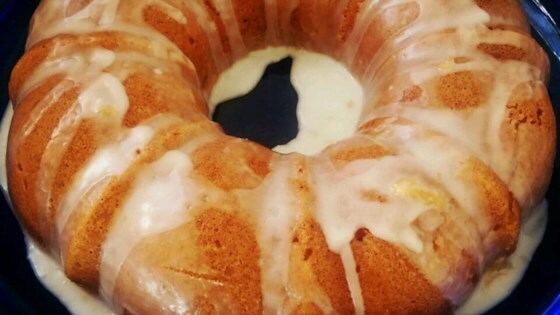 It's a great simple pound cake, good with tea." Preheat oven to 400 degrees F (205 degrees C). Lightly grease and flour one 9 or 10 inch bundt pan. By hand with a spatula cream butter and sugar together until light and fluffy. Add eggs all at once and beat well. Sift the flour and the baking powder together. Add to butter mixture along with 1 cup of the milk. Continue to beat well (the batter will be doughy). Add the remaining 1 cup of milk along with the vanilla, and almond extracts. Pour batter into the prepared pan. Bake at 400 degrees F (205 degrees C) for 1 hour. Reduce heat to 350 degrees F (175 degrees C) and continue baking for 15 minutes longer. Absolutely delicious, a perfect Barbadian Plain Cake! I followed the exact directions, and it turned out 100% perfect.